The courage of Malala Yousafzai continues to amaze us all. After surviving an attack by the Pakistani Taliban in 2012 in which she was shot in the head and neck, Malala Yousafzai went on to become a steadfast advocate for women's education. Currently 16 years old, Malala has spoken in front of the United Nations, blogged for BBC Urdu, released her own book, and was recently nominated for the Nobel Peace Prize. It was only a matter of time before Malala made her way to Washington, DC. 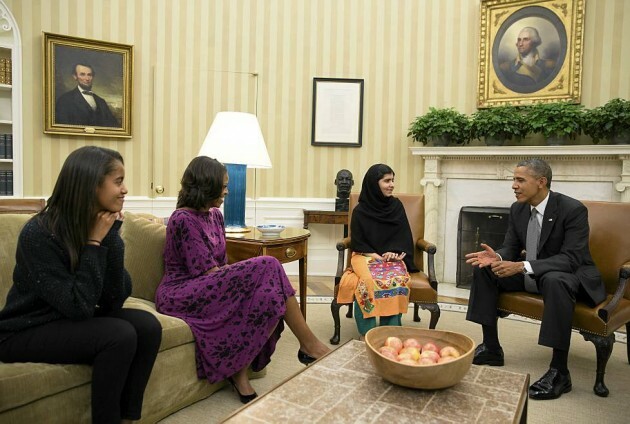 President Barack Obama invited Malala to the White House, where she met the first family and talked about current issues. But Malala made the most of the Oval Office photo-op by raising her concerns to the president over his administration's use of drones. Confronting the leader of the free world on his counter-terrorism and foreign policies, in his office and in front of his family, takes a special kind of courage. Not surprisingly, the official White House statement about the meeting conveniently left Malala's message out, instead taking the opportunity to reaffirm solidarity with Malala and the Pakistani people. Malala had an opportunity that most never come close to having: a 1 on 1 with the president of the United States. If you had the opportunity to say one thing to the president, as Malala did, what would it be?